re: the point that game mechanics have a difficult time adding to or enacting a documentary subject, I think there's a way in which Coup succeeds at this that it sounds like you overlooked. The game (and Mossadegh) progress contingent upon two things: the cat's actions and the rudimentary physics implementation. This works because I think it speaks to the influence of foreign powers (the cat) and the kind of inescapable momentum of his situation. To insert the player as Mossadegh with some kind of agency, I don't think would work at all. Small note: In the scene between Truman and Mossadegh, you incorrectly referred to the samovar tea pot as an oil lamp. Also, my favorite quote was "How do you like THEM apples?" That is a great point and one I did not think about while playing. I think Scott's point that playing the cat that is used to subvert Mossadegh is apt also, which I also mostly glanced over while playing. I am in complete agreement with you that playing as Mossadegh would have been a risky decision. A tea pot! I am clearly not up on my middle-eastern accoutrements. Now what does that symbolize? We've enjoyed seeing how the community has responded to the release of The Cat and the Coup two weeks ago, and I've avoided commenting anywhere, but your thoughtful podcast compels me to chime in for the first time. It's nice to hear you guys' take seriously video games of all sorts, as we have gotten criticism for making the game easy and linear. On the question of whether documentary games should or could provide proper emergence, let's take a step back. My comfort with making The Cat and the Coup a puzzle game stems from my take on video games broadly. I believe that non-digital games and video games have gargantuan overlaps as forms, but I do not see it as: non-digital games are the cake, and the video, sound, and authored story are the icing added on top. ....Video games gained an audience in the '70's right around when theory folks were separately asking if modernism is dead. So let's go with this - even though I personally define a video game as a computer simulated, play-oriented activity with causal choices in the pursuit of goals, I see the form's expressive potential as having no core essence, and any definitions for the form should not act as a privileged filter for evaluating artistic merit. For me the unique qualities of games - flow, punishment and reward systems, input schemes, feedback, and emergence - are aesthetics that are not necessarily more valuable than the "computer as media" side of video games, such as visual and sound design, storytelling, or rapid-fire computation. Video games are a true mixed media, made of interdependent components that derive meaning through their relation to the other parts. Emergence is an opportunity for beauty in the service of some sort of expression, but not all video games need it. Is The Cat and the Coup a vegan cake, with little emergence or punishment systems? Sure, but making a cake that is singularly tasty isn't always the lone goal. I am acutely aware of the anti-puzzle view, as Raph Koster articulated in 2003, "Games will never be mature as long as the designers create them with complete answers to their own puzzles in mind." This makes me think of Ian Bogost's distinction between 'configuration' and 'interpretation'. Something like a movie has to be configured in order to be interpreted. So the plot has to be put together in mind for the viewer can formulate what the film means to them. Games provide the player the reverse dynamic. The player interprets the resources, inputs, graphics, and rules in order to configure that instance of the game. But Bogost asks us not to stop there, that we can interpret in order to configure…in order to once again interpret. Sure, interpreting a game sounds like what we do with poetry and movies. That's fine with me. I see no reason to privilege configuration over interpretation. The indie community is aptly searching and debating the full potential of video games, and we often go back to roots found in games like Go and Chess, for example, but why value the game-specific aspects of video games over all else, really? Isn't it just a personal preference? The perspective goes, without icing on top, it is still a cake, but not the other way around. I don't think you can describe video games that way. The icing is a lie. 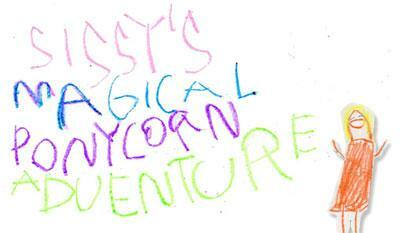 Quick correction - Sissy's Magical Ponycorn Adventure was made with Flash, not with Unity. I love how you guys brought up "My Kid Could Paint That". I was thinking of the same. In this case, the game is clearly a collaborative effort between the dad and his daughter. Developing in Flash is a bit too complex for a child of that age. I can't quite put my finger on it but some other features also seemed like they were suggested by the father. For example, I'm sure details like tutorial messages "I can use rainbows to go to other places" weren't things that a child would think of by itself. But unlike the world of fine arts, which seems to be obsessed with the idea of authenticity, I don't think that's detrimental to the game's success in the games community. On the contrary. Thanks for the correction, Krystian. It's important, because Ryan is an experienced flash game developer and has written a lot of commentary about the flash game scene in general. Good point about "authenticity" as well. Just because some of the ideas were likely "refined" by an adult's perspective doesn't make it any less admirable.